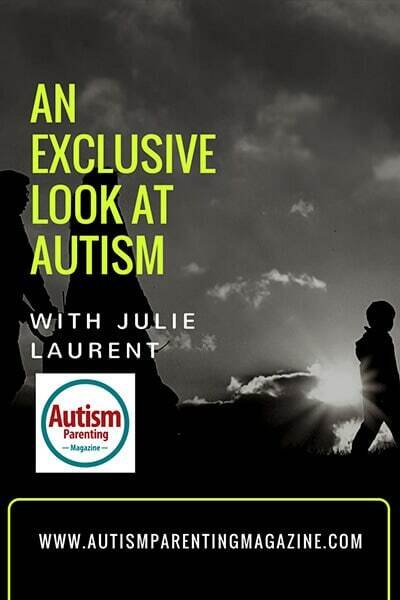 Today’s AUTISM Interview is with Julie Laurent, a country manager in charge of developing CommunicoTool, an app to help nonverbal individuals to communicate by using pictures and sounds. Julie is also the mother of two daughters with autism spectrum disorder (ASD): Sara, age six, and Maia, age four. Sara is almost nonverbal and has been diagnosed as severe on the autism spectrum. She understands a lot, but needs to be talked to in short sentences. Maia, on the other hand, has some speech delays but talks and understands everything. By the time Sara was two years old, she had already lost the few words she knew. Initially we thought it was just a delay in developing her speech, but by the time she reached preschool, her teacher at the time mentioned the school district could provide an evaluation to try to get a better understanding. We did just that when they evaluated for speech, and following those results, eventually led to a developmental evaluation. After final diagnosis, Sara began taking special education classes at the age of three and a half. It then took us about a year and a half to get her the proper services she needed. Raising a child is unique in itself where many of us are confident that our own knowledge, education, and personal experiences will be enough to do *parenting* successfully. Well, when it comes to a child with autism, you can throw all that “common knowledge” of what you thought parenting was into the garbage and start fresh! There is nothing that can prepare you, as you need to push back your limits and the milestones you had fixed for yourself. Most importantly, you need to follow your child’s rhythm and acknowledge appropriate times to gently push him/her towards goals. The most important goal for me is always the happiness of my daughters. As long as they’re happy, then we are all happy! I was looking into apps for Sara’s iPad that would help her communicate better, manage her anxiety, and better understand what was happening, along with a bilingual (French/English) feature. Eventually I came across an article about an app known as CommunicoTool that uses personalized visuals and audio tools to help nonverbal children express themselves. It offers several modules such as the sequence module or the visual schedule that really helps Sara every day. For example, we created a morning routine sequence and use it every day when she enters her classroom. Through her iPad, she follows all the steps from putting her lunch box in the bin to checking the schedule on the wall. She is much more independent now because of the app. Back then, I really didn’t know much about autism and wanted to learn as much as possible to help my daughter. So I eventually reached out to the CEO because I loved the product and wanted to see how I could help somehow. Now, I work part-time as their country manager and the app has really eased all our lives. I’m honestly inspired every day by their smile and happiness. We currently live in Berkeley, California, and are very lucky by the amount of services in our area, especially making every child feel included in the community. The Berkeley school district provides a team of therapists at school who have been able to pair Sara up to do one-on-one IA. The Regional Center in Berkeley even provides respite hours that help parents breathe a little. We also have one of the best ABA agencies called BIA that has been following Sara every day for almost three years now. They’ve put a program and a team together to fit her specific needs. Try to create good routines and maintain consistency with your child as much as possible. Work as a team with the professionals that surround your child every day to follow as best you can what they are doing during school and therapies for continuity. Most of importantly, just try your best!! For more information about Julie, please visit her LinkedIn profile. Derrick Hayes is an author, motivational speaker, and paraprofessional with students with autism in the Muscogee County School District in Columbus, Georgia. For contact or booking information visit www.derrickhayes.com , email info@derrickhayes.com, or call (706) 615-1662.